Draped over a hill, surrounded by tea plantations and backed by a splendid stretch of the Western Ghats, take a short walk through tea plantations or go for a ride in a disco rickshaw. 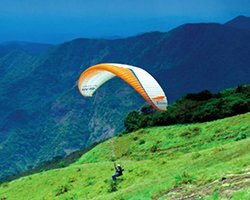 The Western Ghats is famous for its picture book towns, sprawling tea gardens, mist clad hills, sanctuaries and above all the climate is one of the most sought after tourist destination in India today. Full sightseeing of Thekkady and munnar, visiting wildlife century also enjoy other delightful and exciting activities such as spice plantations tour, bamboo rafting, jungle trekking and elephant ride. Do not forget to make a visit to local spice market for buying handicrafts and some garden fresh spices. Don't miss the beautiful chance and book the kerala tour package today. Early Morning before 7.00am proceed to Gavi, Gavi is an eco-tourist spot in Kerala which has become popular after 'Alistair International' the world acclaimed tourism major publication listed it among the leading eco-tourism centres and one of the must-see places in India. Reach Gavi by 8.00 am, Register. After breakfast, plantation visit under trained guide to fully enjoy the natural beauty of Gavi. After veg lunch proceed for a relaxing row boat ride, Then proceed for a visit to the cardamom plantation and inhale aromatic whiffs of cardamom and then to the curing house. Sabarimala viewpoint is the next spot in the itinerary, the scenic beauty spot to capture the panoramic view of the Sabarimala hills and the pilgrim spot. Later proceed to the Museum where the skeletons of the animals are preserved.Indulge yourself for to a refreshing tea break before dispersing at 4.30 pm. Later proceed back to Hotel at Thekkady. Wake up to the lap of nature. After early breakfast at Thekkady, proceed to Alleppey at 8.00am. By noon check in to the Houseboat for a 20 hour long stay and 5 hour cruise through the world famous backwaters of Kerala. Houseboat (Kettuvalloms) is a indigenously developed and designed private boat with fully furnished spacious bath attached bed rooms, hygiene kitchen ,dining area and private front deck to capture the beauty of the back waters. The cruise through palm fringed narrow canals, the unique life of the backwater people and above all the nature around you will make long lasting impressions in your mind. Overnight stay in a houseboat.